Finland’s farflung mobile phone manufacturer Nokia and Dutch personal navigation device (PND) vendor TomTom continue to make progress toward their multi-billion-dollar acquisitions of navigable digital mapmakers Navteq and Tele Atlas, respectively. But a regulatory challenge in Europe may complicate TomTom’s effort, while Nokia appears likely to sail through unchallenged in the United States. On Wednesday, December 12, Navteq shareholders approved Nokia’s offer to purchase the company’s stock for for $78 (€55.11) per share. Some 75 percent of the issued and outstanding shares of common stock eligible to vote, representing over 99 percent of the total votes cast at the special meeting, supported adoption of the merger agreement. At a December 4 “extraordinary general meeting” (EGM) of its shareholders TomTom approved the Tele Atlas acquisition proposal (€30 or $43.91 per share) with 78,947,096 shares in support. That represents 69.56 percent of the total issued share capital and 99.82 percent of the shares represented during the EGM. The commission now has until April 17, 2008, to conduct a so-called Phase II investigation and make a final decision on whether the Tele Atlas purchase would lead a vertical restraint of competition. That certainly seemed to be what one U.S. company was suggesting today (December 12) as it dropped out of the PND mass market. Perhaps motivated by similar fears, in late November GPS manufacturer Garmin International — thwarted in its late-entry attempt to buy Tele Atlas out from under TomTom — signed a long-term deal with Navteq. Some observers believe that closer relationships between map technology and portable device manufacturers will benefit end users as well as the companies involved in the deals. 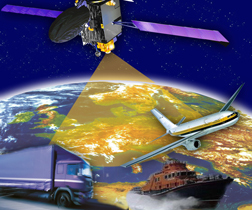 One of these proponents of the deals is John Pottle, marketing director at Spirent Communications, a global telecom test and measurement company that contributed to the SUPL standard and specifications and also offers a well-known line of GNSS simulators. In the on-line version of navigable map competition, Microsoft announced its purchase of UK-based MultiMap, a popular on-line mapping service, for a reported $50 million. Microsoft is trying to gain ground in a market dominated by Google Maps and Google Earth. To further complicate the picture, on December 5 TomTom announced that it would team up with Google to allow users to send business addresses directly from the Google Maps website to TomTom PNDs. Google Maps’ local search page now features a one-click “Send to GPS” data transfer.